We are in full Halloween mode here: decorations are up, costumes are in progress, treats have been purchased. And something I’m extra excited about this year: we’re having a trick-or treat party. Every year while growing up, our house was home base for trick or treating friends. We’d all meet up there, my parents would order lots of pizza, and we’d spend Halloween coming and going and eating too much candy. This year, we’re having some friends over to do the same thing with our kids, and I’m totally geeking out about it. 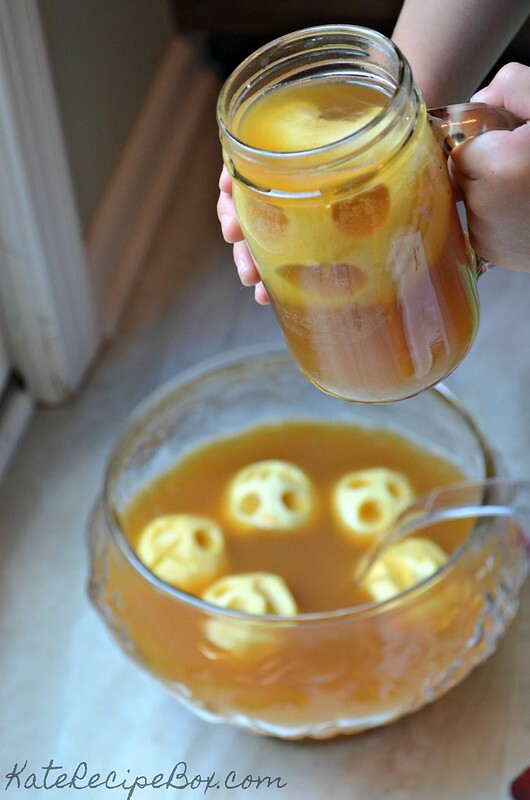 If you’re hosting a trick or treat party – or other Halloween party – this is the perfect spooky drink to make. Leave it virgin for the kids, or spike it up with caramel vodka, vanilla vodka, or Fireball for the adults. You can make the apples ahead and mix up the punch in less than five minutes when you’re ready for it. Carving the shrunken apple heads is the most difficult part of this, but the beauty is it’s Halloween – they can be perfectly imperfect. 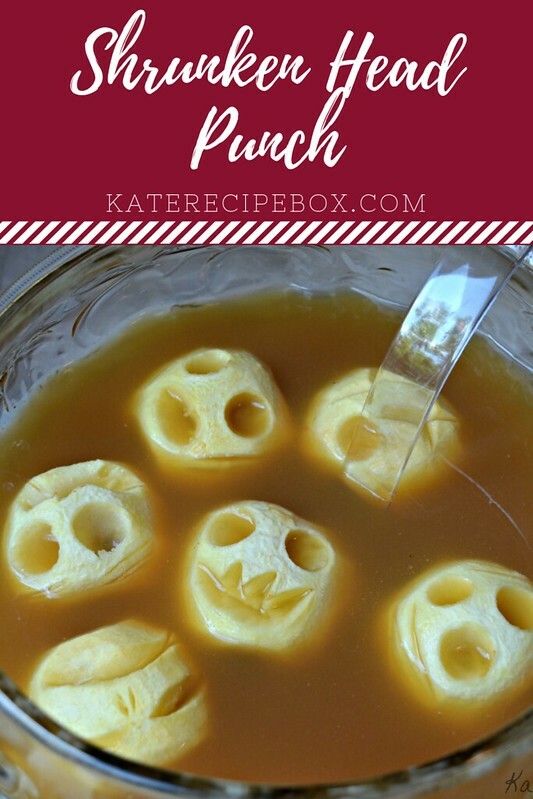 You can also make the faces to match the crowd – scarier faces for an older crowd while silly faces would be perfect for a preschool gathering. 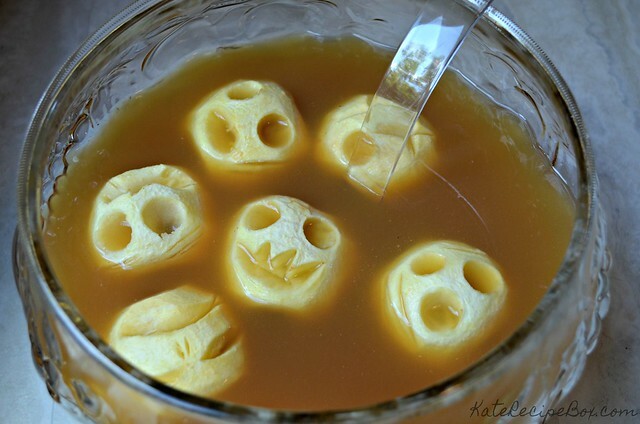 We had a lot of fun with this – the kids especially got a kick out of “the faces floating in there”! Working with one apple at a time, peel and core the apples, then cut in half. Using a paring knife or other tool, carve faces into the apple halves and dunk in the lemon juice. Lay the carved apples on a rack over a baking sheet. When they are all carved, transfer the baking sheet to the oven and bake for 1-2 hours, until the apples appear shrunken. Remove from the oven and cool. 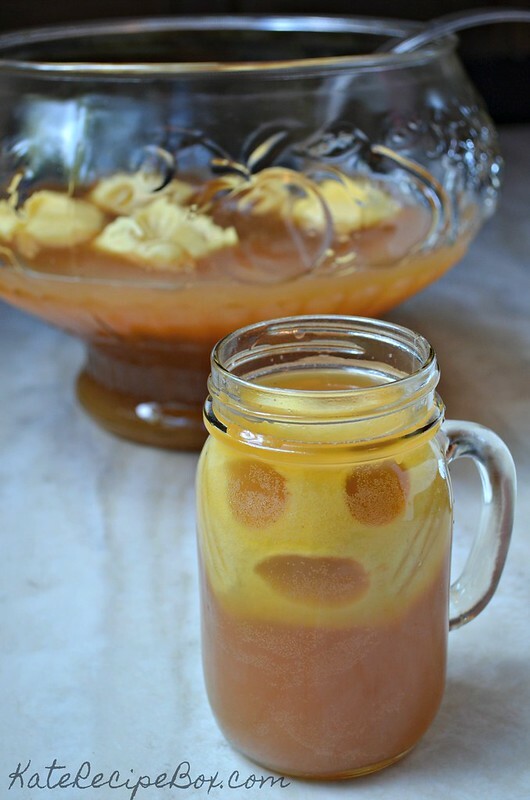 Combine the apple cider, pear nectar, and ginger ale in a punch bowl or large pitcher. Add the cooled apple heads, and alcohol, if desired. Looking for more Halloween inspiration? Here you go! And check back on Thursday when we’ll have another round of Halloween goodies ready for you!